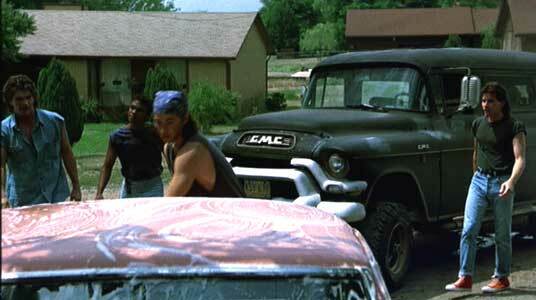 Keanu Reeves and Joshua Taylor wear white, red, and black high top Converse “Chuck Taylor” All Stars in the film. Chris and Lauren must learn to cope with David’s death. David Sinclair (Alan Boyce) is a high school senior with everything seemingly going for him. He is popular at school in his coastal New Jersey town and has two girls, Lauren (Jennifer Rubin) and Kim (Pamela Gidley) interested in him. He is a gifted musician who leads his own rock band, gives lessons to the other band members, and is getting ready for their first major recording session in a studio. At school he has been asked to arrange the music for their production of Gilbert and Sullivan’s H.M.S. 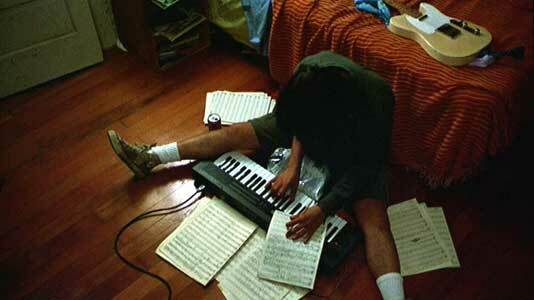 Pinafore, and early in the film we learn that he has received a scholarship to a prestigious music school. Yet there is something not quite right about David: he has a disconnect from things and people. While seemingly busy all the time, he is not comfortable with himself and has trouble expressing his inner emotions to others. He has everything that most teenagers might want, none of the usual problems, yet there seems to be little joy in his life. He has relationships with people but no real intimacy. Kim tells him one evening after sleeping together that they have a great thing together because they don’t say anything or ask any questions. David replies, “Is it great?” She goes on to say that “I wonder if we are normal because most people who do what they do would be said to be going together.” He nods and says “well at least we don’t cheat on each other.” Later that evening he tells his little brother Nicky (Joshua Taylor) who idolizes him, that he would love to change places with him. Nicky could go to high school and get the good grades and the girl, while he home and slept all day in his bed. His family and circle of friends, led by Chris Townsend (Keanu Reeves), seem oblivious to all of this tension until one night David upsets their world by calmly walking to the edge of a nearby cliff during a party given by Chris, and kills himself by jumping off of it. After David’s suicide, Chris and others wandered around school in a daze. The reaction of everyone is of great shock and the town’s reaction is that David’s death had to be the result of a tragic accident. M.G. (Michelle Meyrink), Chris’ girlfriend, becomes obsessed with writing down what she thought that David was thinking about his last few days. Chris, who was the last person to see David alive, begins to blame himself for David’s death, a thought that is compounded when he goes to David’s room and discovers a suicide note that David had left for him. Later when Chris tells David’s parents (Barry Corbin and Kathy Baker) about the note, he also remembers that David never even screamed. Now everyone realizes that everything David did in his last few days was his tortured and uncommunicative way of trying to say goodbye. Everyone who knew him begins to feel guilty because “shouldn’t someone have known? Couldn’t someone have done something?” Pressure builds up the most on Chris and he acts out at school when the principal (Richard Bradford) cancels a memorial service that they were planning. His father takes his guitar away, and Chris goes out and gets drunk. When he drives his car into David’s yard he almost hits Nicky (also on a destructive rampage). David’s father comes out to chew him out and Chris collapses in grief, crying and shouting “I should have stopped him”. And David’s father comforts him, starting the healing process starts for both of them. The balance of the movie focuses on David’s friends as each of them goes through the several stages of grief: their sorrow, their denial, their guilt, and their anger for the emptiness he has left in their lives. They then start to rebuild their lives in various ways. The principal tells Chris that he should complete the orchestrations for the school musical. Permanent Record gives you an interesting view on teenaged suicide. The director Marisa Silver and the screenwriters Jarre Fees, Larry Ketron, and Alice Liddle let the story unfold through the eyes and actions of many of the characters, without getting in the way or trying to be too preachy or maudlin. The world of David, Chris, and their friends is not one of drugs, broken homes, or other problems. These are typical middle class teenagers with the normal problems of acceptance, pressure to get good grades, acceptance into the right college, and romantic entanglements. David’s suicide seems more inexplicable in this background, because on the surface he was one of the most successful students in the school. And so Permanent Record works as a character study. Keanu Reeves and his lesser known co-stars are credible in their roles because they project some of their own personalities and earnestness into their roles, and Reeves puts some real emotion in several of his key scenes that makes the film work. There are some flaws in the storyline. The whole idea that David and late Chris would need to rearrange the score to HMS Pinafore is ridiculous, given the fact that the production looks exactly like every other Pinafore production, and uses the exact same cast and orchestra as the original, and theatre groups have performed it with the original orchestration for over 100 years. You can even see the orchestra members playing off the published parts during the musical sequences, and the sound is exactly the same as the original. Making a new arrangement of the score would only make sense if they were trying to update the sound by adding guitars and a rock soundtrack or some other contemporary idiom. The plot device that set Chris off on a rampage (cancelling the memorial service that the students were planning for David) also seems contrived and not a normal response. If the school district superintendent really wanted to diffuse things and get them back on track at the high school, why would he want to cancel an opportunity for the students to get some of the grief out of their systems so that they could start to move on? But overall Permanent Record creates a vehicle that is thought provoking for its target audience of teenagers and young parents. The band members tell Chris that they want to go ahead with the recording session, even without David. M.G. follows Chris onto the subway. 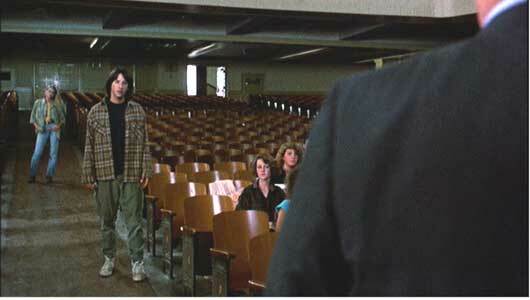 Keanu Reeves in his role as Chris wears well worn and dirty white high top chucks in a number of the scenes in the film when he’s not wearing his other outfit of shorts with boots. They fit in well with his role as the easy-going friend with shaggy hair and baggy clothes who suddenly is set adrift by the tragic events, and takes a while to recover his direction. One of the band members also wears red high tops in a couple of brief scenes and David’s younger brother Nicky wears black high tops. The best scene is where you see Chris working on the music for a recording session that his band had planned to do before David’s death, and now they want to make the recording anyway. Chris works on the music for the recording session. Permanent Record. (1988) Keanu Reeves, Alan Boyce, Michelle Meyrink, Jennifer Rubin, Barry Corbin, Kathy Baker, Pamela Gidley, Michael Elgart, Dakin Matthews, Joshua Taylor, Richard Bradford. Directed by Marisa Silver. Categories: Drama, Teenagers.